Today's post is all about gifts for the fitness fanatic in your life! Let's start with the gift in my photos -a Buddha Box by Phat Buddha! 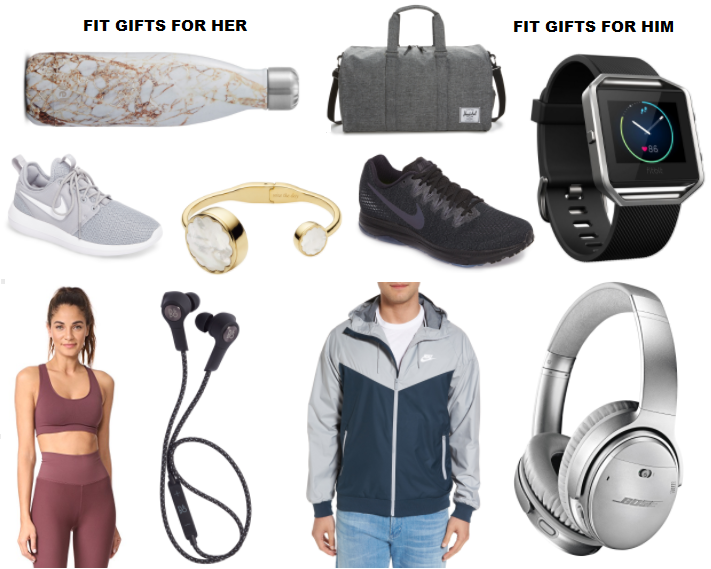 I love this gift idea because it gives the gift of a full outfit! Choose your favorite pieces from the brand, place your order & your items will arrive wrapped & ready to gift! I received the Northern Boulevard sports bra & JFK leggings in black. Both pieces are sleek, stylish & so comfortable!! Plus all of Phat Buddha's items are seamless & one size fit all so there's no need to worry about choosing the right size for each friend & family member. A few of my other current favorites on the Phat Buddha site include: the St Marks Place sports bra, Columbia U bomber jacket & Cotton Club leggings. 1. nike sneakers - for him - love this sleek pair. They can be worn in and out of the gym. 2. nike sneakers - for her - a good pair of sneakers is a must for working out or dressing the athleisure part. These are so comfy & can be worn with almost everything. 3. Bose headphones - for him - Does anyone go to the gym without headphones?? Get your guy a sleek pair that are also wireless & noise cancelling. 4. wireless ear buds - for her - another wireless option, but without the bulk. These fit perfectly into your ear & stay put during an intense workout. 5. Kate Spade bangle tracker - for her - I'm totally obsessed with this tracker. It seems there's nothing it can't do. From tracking your steps, sleep & habits to taking selfies! Plus it never needs to be charged and is super cute to be worn everyday. 6. fitbit blaze - for him - one of the latest products from FitBit, this watch calculates calories burned, steps taken & measures quality of sleep. During your workouts, the watch tracks your heart rate & it has a mobile app that syncs to tell you a ton more information about your health & habits. 7. S'Well water bottle - IMO, nothing beats a S'well water bottle. They are sleek & stylish looking plus keep your drinks hot or cold for hours. 9. phat buddha - for her - the brand has so many amazing pairs of leggings and sports bras & I love that they are regularly coming out with new color palettes & styles. It guarantees that your BFF won't already have the gift you pick out for her! 10. gym bag - a large sturdy duffle bag is a must for carrying everything from an extra pair of clothes, to sneakers, to water bottles or workout gear. Bonus - this one can double as a duffle bag for weekend getaways. Hope everyone has a great weekend! I was a little under the weather this weekend but I am pushing through because Jody & I are heading up to Boston this weekend! PS. Today is Free Shipping Day! Another super sale day leading up to the holidays. Shop these great sales today to get free shipping & delivery by Christmas! PPS. Shop some of these great sales this weekend! Buddha Box sounds so cool! I never heard about it until today! It is fabulous and makes for such an easy gift! These are good gift ideas. I love the marble water bottle. I hope you feel better soon, and have a wonderful time in Boston!! That's a really lovely box you got there dear! Swell water bottles are my favorite. I upgraded to the larger size in order to keep me accountable to drinking more water at work. I would like to check the earbuds out for me and the headphones for Mr.